The most-awaited Navratri festival is celebrated across India and in Hyderabad with religious fervour rendering dandiya and garba group dance forms in traditional colourful dresses and folk song recitals praising the nine avatars of Goddess Durga. The nine-day festival is solely dedicated to Ma Durga and every State celebrates in its own unique style based on local culture, tradition and myths. 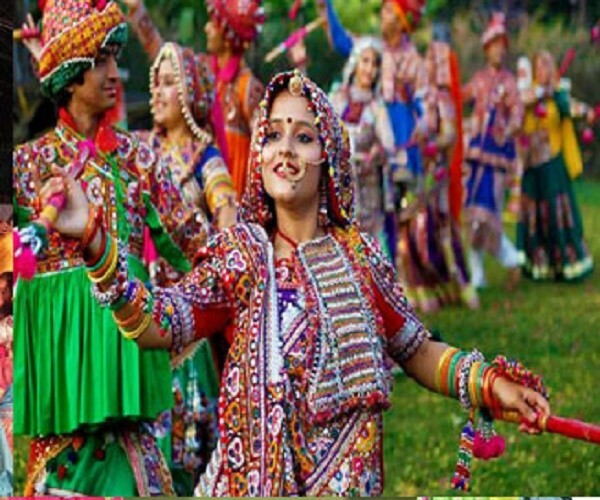 The dandiya and garba raas of Gujarat and Durga pujas of West Bengal being the most popular ones among all. Aa per the Hindu mythology, Goddess Durga is revered and offered pujas marking the killing of asur, the invincible Mahishasura. It also symbolizes the victory of good over evil and that too from a female goddess. ALSO READ: Why KCR’s Call For 'Dismissing Concurrent List' Is Part Of 'Economic And Political Overhaul' In India? In Hyderabad, Navratri is celebrated across the twin cities by setting up of Durga pandals in societies and in lanes. The residents organise dandiya and garba dances with lighting and music systems after taking police permission which allows it till 11:30 pm. Namdhari Gaurav Navratri Utsav, known for its royal past, opens its arms to one and all from all parts of the world. The overwhelming response they received over the last decade has given this year’s dandiya more strength and courage to make it bigger and better year after year. Navratri Utsav organised by Navkar Events along with We Connect and Shilpi events is a star-studded Navratri celebration that brings people together for evenings full of garba, dandiya and delicious food. Many exciting prizes are distributed at the night with full of fun, frolic and live music band. Dandiya Night 2018 at Skyhy, People frok all ages perform dandiya consisting of two dance styles garba and raas. Dandiya Dhoom 2018 presented by Rotaract District 3150. The event is hosted and initiated by RAC New Age Engineers. Swing Zara Dandiya under the stars at the highest point in Hi-Tech City located right at the centre of the concrete jungle. They are presenting live DJ, dandiya and garba Instructors. Also, food stalls and shopping stalls like jewels, sarees, dresses and many more are set at the event.